The applet below contains a quadrilateral that ALWAYS remains a SQUARE. 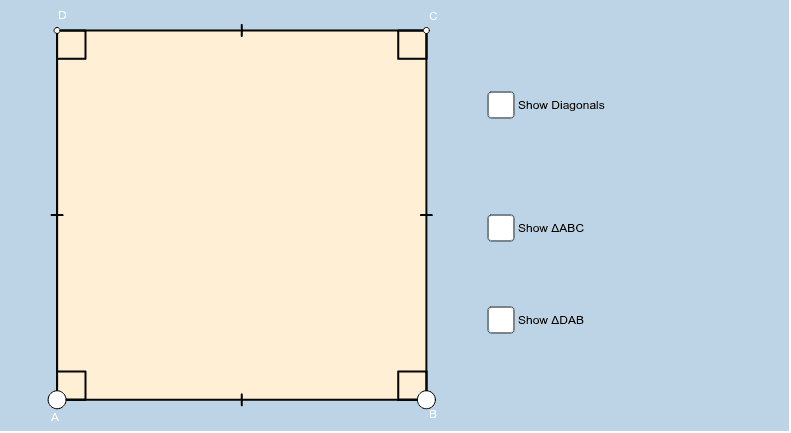 The purpose of this applet is to help you understand many of the geometric properties a square has. Interact with this applet for a few minutes. Then, answer the questions that follow. Be sure to move the two BIG white vertices around during your investigation! Use this applet to investigate the answers to the following questions. As you answer each question, be sure to drag the white points around to "put the square to the test", so to speak! 1) Is a square a parallelogram? If so, why? 2) Are opposite sides of a square congruent? 3) Are opposite angles of a square congruent? 4) Do the diagonals of a square bisect each other? 5) Does a diagonal of a square bisect a pair of opposite angles? 6) Are the diagonals of a square perpendicular? 7) Are the diagonals of a square congruent? 8) Does either diagonal of a square serve as a line of symmetry? If so, how many do?